Accelerate your PC for faster boot-up and blazing-fast gaming and graphics when you upgrade to a SanDisk Ultra® 3D SSD. You’ll notice that applications load faster and files move quicker—plus you’ll get longer battery life and much cooler, quieter computing(2). No matter how you use your PC, SanDisk’s powerful 3D NAND and nCache 2.0 technologies make for a better experience, delivering lightning-fast speed and staying power whether you’re strafing the enemy, editing video or just surfing the Internet. Proven shock and vibration resistance mean you won’t lose your data even if you drop your computer. 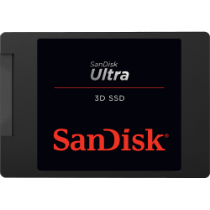 When you’re ready for a better computing experience the SanDisk Ultra® 3D SSD catapults your performance to new levels. Get up to 560MB/s sequential read speeds (550MB/s for 250GB) for faster boot-up and better overall system performance. Load and run applications, games, videos, and photos in an instant so you can spend more time doing, and less time waiting. (1) 1GB=1,000,000,000 bytes. Actual user storage less. (2) Based on internal testing; performance may be lower depending on drive capacity, host device, OS and application. 1MB=1,000,000 bytes (3) Based on internal testing using Telcordia stress part testing.